Simulation made in this research as beginning of the project “Human Controlled Robotic Arms” where simulation has the ability to provide information about the position and depicting simulation of each joint link in Mitsubishi RV-M1 Robotic arms. Simulation uses MATLAB software as basic programme, and Robotics Toolbox 9.10 from Peter Corke to provide 3 (three) Dimension view for 5 (Five) Degrees of freedom robotic arms. Simulation successfully perform all its function and match its actual robot parameters, hopefully simulation could be developed further for basics development of other type robotics arm in respect to “Human Controlled Robotic Arms” Research. 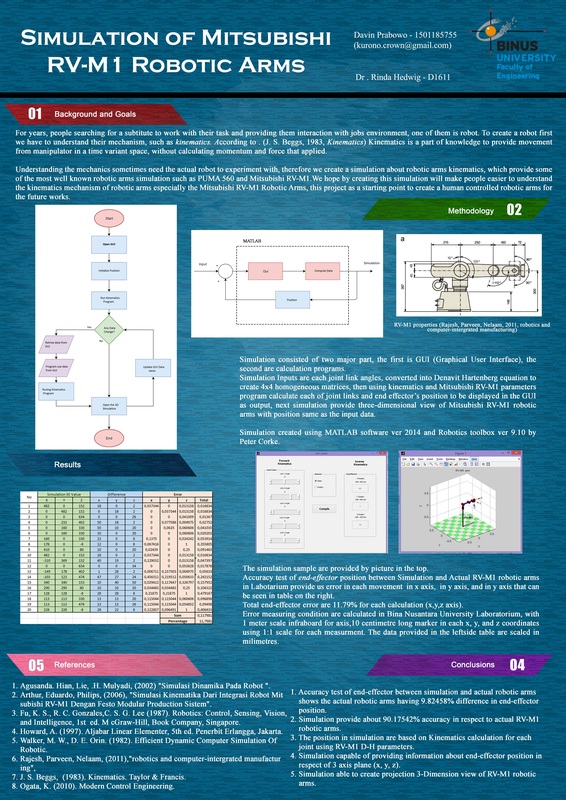 Keywords : Robotics Arms Simulation, software, Mitsubishi RV-M1, MATLAB, Robotic Toolbox 9.10, 3 Dimension, 5 degree of freedom.